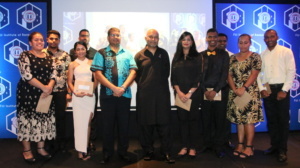 The Fiji Institute of Bankers (FIB) rewarded some of its members for their tremendous hard work through the year in raising banking to the next level during the Awards Presentation held on Thursday 22 March 2018 at the Holiday Inn, Suva with more than 300 members celebrating industry achievements. “Bankers have given greater contribution towards the economic development of Fiji over the past years” says FIB President Saud Minam. 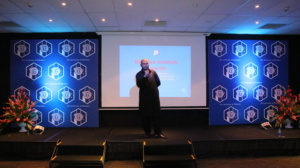 He would like to see membership grow this year as they drive value towards their members. Meanwhile, there were two categories of awards which include Category Awards and Lifetime Achievement Awards. 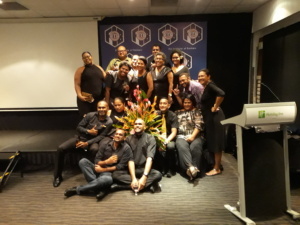 Westpac Banking Corporation took home five (5) awards while ANZ Bank, Bank of Baroda and HFC Bank also bagged one prize each in the Category Award. In the Category Awards category, the ‘Corporate Banker of the Year’ was awarded to Dharmendra Dipak Nand of Bank of Baroda. The ‘Socially Responsible Banker of the Year Award’ was given to Westpac Microfinance, Women’s Markets and Everywhere Banking Team. Westpac Banking Corporation’s employee Pravesh Singh was awarded with the ‘Young Banker, Highest Achiever of the Year’ for being the young and enthusiastic member. The ‘Innovative Banker of the Year’ was awarded to Rigamoto Fonmanu of Westpac Banking Corporation. The ‘Investment Banker of the Year’ award went to Mohammed Iaheed Khan of Westpac Banking Corporation. The ‘Governor’s Award’ was given to Shoran Devi from HFC while the ‘Peoples Person Banker of the Year’ is awarded to Ritesh Singh from ANZ Banking Group Pacific Operations. These young members were awarded for their dedication and hard work in delivering banking services to all their customers and being effective members of the Institution. 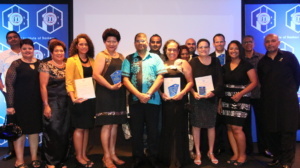 In the Lifetime Achievement Awards the Fiji Institute of Bankers ‘Lifetime Achievement Award’ were presented to 23 members for their long years of membership and distinguished as well as meritorious services. FIB President Saud Minam conveyed his congratulations to these awardees for their distinguished, dedications and meritorious services to the Banking Industry and also as role models for young members. 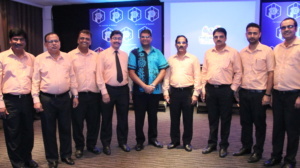 The Institute also announced that nine of its members had been awarded education scholarships through its 2018 Scholarship Programme. The FIB and its Affiliates would like to congratulate all Scholarship recipients and wishes them a very successful academic year and all the best for the successful completion of their programme. 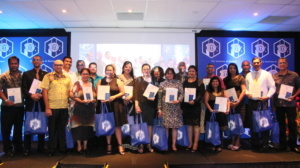 All the Awards were presented by the Reserve Bank of Fiji Governor Ariff Ali. More Awards photos can be viewed in the Gallery.